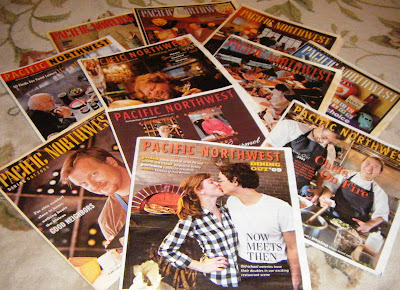 I hope you had a chance to relax with Sunday’s paper the old fashioned way (via newsprint) and read “Dining Out 2009” when, once again, our Pacific Northwest magazine was devoted to my favorite subject. Time flies when you love to dine out, as I mentioned in last year’s blog-post “A Decade of Dining Out.” That post linked to a 10-year retrospective of my Sunday magazine restaurant cover-stories (a service the old-fashioned print version famously doesn’t provide). This year I profiled 10 pairs of restaurant notables old and new, representing a look at where we’ve been and where we’re going. Missed it? Read it right here. Whenever I write these magazine pieces, I hear from readers who suggest I’ve left out their favorite spot, or failed to mention a hot new (or fabulous “old”) restaurant they adore, or otherwise managed to miss the boat. And, as always, your comments are most welcome.